The American Foxhound Temperament is independent, energetic and even-tempered. The breed dates back to the American Revolutionary War. As their name suggests, these dogs hunted foxes on the estates of American statesmen such as George Washington and Thomas Jefferson. These dogs purpose were to pursue their prey for long distances over rough terrain. They need an outlet for their energy or they can become bored and destructive. American Foxhounds make excellent companions for jogging, hiking, camping, hunting, or romping with other dogs. American Foxhounds traditionally to live and hunt in packs. They sometimes live with dozens or even hundreds of other hounds and thrive with social contact. They also do very well in multi-dog households. If you own only one American Foxhound, you will need to spend a lot of time with him or her. You may also need to invest in doggie daycare if you are away from the house for long periods of time. This breed can become depressed when they are kept in isolation. Many people consider their “baying” to be beautiful and musical. However, if you do not care for canine vocalizations, this breed is not for you. Because of their vocal tendencies, American Foxhounds are not ideal for apartment complexes. Like most pack hunters, American Foxhounds follow their noses and make their own decisions. Because of this, some owners describe them as stubborn and/or difficult. When they catch an interesting scent they will stop at nothing to follow the trail! They have been known to scale fences or dig holes in order to track down an interesting smell. As long as they are socialized properly, American Foxhounds have very sweet temperaments and make excellent companions for children. American Foxhounds are one of America’s first native breeds, and today they are the state dog of Virginia. While in America, English Foxhounds were crossed with other hounds to increase their size and speed. Today, modern American Foxhounds look like larger, taller versions of their English cousins. American Foxhounds also resemble larger versions of the Beagle and Harrier, which are smaller members of the hound group. American Foxhounds are tall and muscular and weigh between 60-70 lbs. They have long droopy ears and large “puppy dog” eyes. They come in a wide variety of colors, but the classic look is tricolor with a black saddle. Because they are independent thinkers, training your American Foxhound requires patience and an upbeat attitude. Use positive reinforcement methods and never use physical reprimands to punish your dog. If possible, enroll in an obedience class to work with a positive reinforcement trainer in your area. Once your American Foxhound has been through a basic obedience class, be sure to check out other canine activities such as nosework competitions. Even after they are fully trained, American Foxhounds should not be off-leash in open areas. They can follow their nose into traffic or they can wander after a scent and become lost. American Foxhounds generally live between 10-12 years. They are a healthy breed, but it is important to maintain regular veterinary care. Monthly heartworm preventative is a must. This is especially crucial for this breed since they tend to spend a great deal of time outdoors. Note: Get a copy of The Ultimate Guide to Dog Health if you are serious about growing up a healthy American Foxhound. The coat of the American Foxhound is short and low-maintenance. Weekly brushing and occasional bathing will suffice. And you can go check this out or step by step grooming tips. American Foxhounds are prevalent in shelters. If you are thinking of adding an American Foxhound to your family, please make adoption your first option. There is no shortage of homeless Foxhounds in this country, especially in rural shelters. For your first step, call your local animal shelter or humane society. Talk to the staff and let them know that you are looking for an American Foxhound or American Foxhound mix. Ask if they have a waiting list for this breed. Also let them know if you would be open to other hound mixes such as Beagles, Harriers or English Foxhounds. If you are open to similar breeds, you may be matched more quickly. Visit adoption websites such as Petfinder, AdoptaPet and Get Your Pet. There are countless Foxhound Rescue organizations and Hound Rescues around the United States. Simply go to a search engine such as Google and type in the name of your state plus “Foxhound Rescue” to find the closest rescue groups. There is a very active facebook group called Hound Networking Group that you can join to see urgent hounds needing homes from various rescue organizations around the country. All Hounds Rescue Network, Coonhound Highway and Southern Hounds Rescue Network are additional networking sites for homeless hounds. You will find adult dogs as well as puppies posted on these sites. The cost of adopting an American Foxhound depends on the individual organization. Adoption fees usually run between $75-$150. American Foxhounds that are acquired through rescue organizations usually come spayed/neutered and vetted. If you opt to purchase an American Foxhound puppy from a breeder, you will need to invest substantial time and energy to make sure that your new pet comes from a reputable source. Do not order a puppy over the internet. Avoid pet stores as well. These puppies may come from unscrupulous breeding operations called puppy mills. The dogs from these breeding factories are frequently sick and full of genetic abnormalities due to irresponsible breeding practices. Instead, contact the national American Foxhound club and ask for referrals for reputable breeders in your part of the country. Also, ask to view medical records for the breeding animals. If the breeder does not welcome you onto the property, this is a warning sign. The price of American Foxhound puppies for sale varies from breeder to breeder. The cost of an American Foxhound puppy can range from $400 to over $1000, or even higher for show-quality bloodlines. Conclusion: Why the American Foxhound? 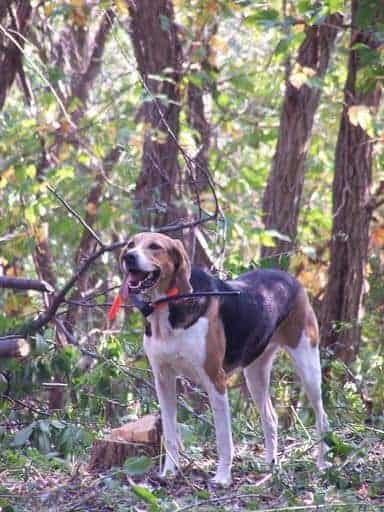 If you are looking for an energetic companion with an all-around great temperament, the American Foxhound might be the dog for you! Prospective owners should research the breed thoroughly to make sure that the American Foxhound temperament is a good match for their lifestyle. Previous post: Norwegian Elkhound Temperament (Bold, Strong-Willed): Can You Handle It?